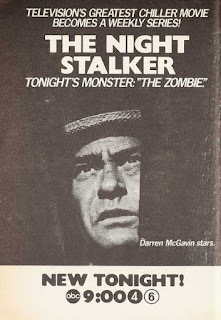 On the second episode of Kolchak: The Night Stalker, Carl Kolchak squared off against the Italian and African-American mob of Chicago as well as the titular zombie. Written by Zekial Marko and David Chase, the episode was directed by Alexander Grasshoff (The Jailbreakers). The episode introduces us to Carol Ann Susi as Monique Marmelstein, the niece of INS's publisher. This was one story that might have benefited from being a 2 parter, where you could have had scenes of the zombie before he was killed and resurrected. Certainly there was much that was talked about rather than seen. And I'm still reeling about the scene where Kolchak chases the zombie, and the zombie boards a bus to get to his resting place in the junkyard! The quick shots of the decomposed revenant we get makes me wonder just how inattentive the bus driver on a well-lit bus was not to notice this thing boarding! And did it have exact change? I'm trying to figure out what you guys were talking about in regards to this episode not including the details for the plot. The old Mamaloa was the zombie's grandmother. This was explicitly stated. She had a photo of him, talked about not being able to attend her grandson's funeral, and Kolchak stated that the victims were all involved in his murder. I don't think the plot was missing anything.